I read about this on MaryJane Farmgirl blog. I decided to give it a try. It is very simple and I love simple. It is also inexpensive which is always a bonus. 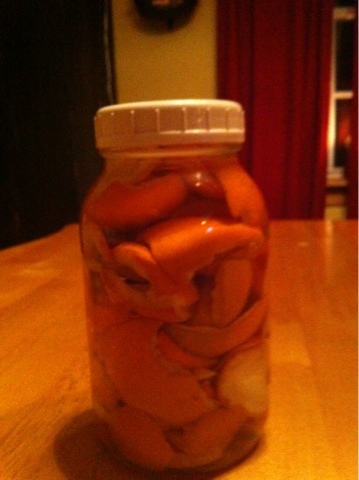 Take the peels from oranges and place them in a jar. Add White Vinegar with 5 percent acidity. Put on a lid. Let sit for 2 weeks. Store vinegar mixture in a jar. When you are ready to use place 1/3 vinegar mixture with 2/3 water in a sprayer bottle. Shake well. When I made my first batch I missed the mix with water step and my cleaner was like WOW with the vinegar smell. I thought maybe this cleaner was not for me. But after following the directions more carefully it works great. There will be some vinegar smell when you use it but it will dissipate and the citrus smell will linger. You can use lemon, lime, and grapefruit peels as well. I did find a website that has several recipes along with tips on making your own cleaners using vinegar that I thought I would pass along. I am definately going to try some of her combinations. There are a lot of uses for vinegar. I keep several gallons on hand. Here is another site that gives 1001 uses for vinegar. Economical, Environmentally friendly, 1001 uses...whats not to love!